100% RISK FREE SATISFACTION GUARANTEE. 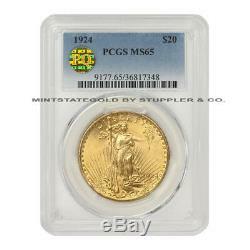 Gaudens graded MS65 by PCGS. 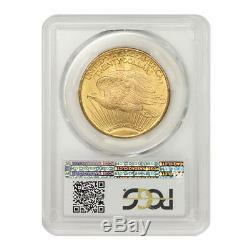 This Gold Double Eagle is nicely struck with good definition in the devices. The surfaces are extremely lustrous and gleam with a bright original mint luster. This Saint is very attractive for the grade and is sure to make a good addition to any Gold collection. This outstanding investment coin has also been awarded the prestigious PQ Approved sticker for its impeccable condition. A PQ Approved sticker is awarded to exceptional coins that pass a strict grading standard. Own this terrific Saint Gaudens Gem today! Any comparative pricing and population values were current at the time this listing was created. Pricing and pop values are subject to change. Take your time and check out your merchandise up close and personal and see for yourself that it is everything we say it is! Mint State Gold does not! Love it or send it back! NO hassles, NO excuses, NO delays... PNG membership is an honor and privilege restricted to the world's most highly respected rare coin and precious metal dealers. About the Professional Numismatists Guild (PNG). PNG's Code of Ethics and Standards for membership require that PNG only accept the most ethical professionals as members. Every PNG member MUST adhere to the strict Code of Ethics and Standards set forth by PNG. Admittance to PNG is voted upon by the PNG membership. PNG Collector's Bill of Rights (see below). A note from Barry Stuppler, PNG member since 1982, and the Founder and President of Mint State Gold, a division of Stuppler & Co. Serving on the PNG Board of Directors for the past three years, I have had the privilege of experiencing first-hand why PNG is the premier organization for Rare Coin and Precious Metal Professionals. Barry Stuppler PNG member #334. Currently sits on the PNG Board of Directors; elected to the Board in 2009. 1982 co-founder of The Industry Council for Tangible Assets (ICTA) and current member of ICTA Board of Directors. ICTA serves as the national trade association for all dealers, collectors, and investors. The ANA is the world's largest numismatic organization, with over 30,000 members. Current President of the California Coin and Bullion Merchants Association (CCBMA). Founded Stuppler & Company, Inc. Com's parent company) in 1995. One of the nation's most well known and highly respected coin dealers. 50+ year veteran in the rare coin & precious metal community. PNG Collector's Bill of Rights. To reaffirm PNG's commitment to collectors and the numismatic fraternity, the Professional Numismatists Guild has adopted a Collector's Bill of Rights. This ten-point pledge of consumer protection and education puts extra security into the hands of collectors, letting them know they can do business in the way it should be done --- in a professional manner and with dealers of the highest integrity, who will stand behind the merchandise they sell. The Professional Numismatists Guild is proud to present this pledge to the numismatic community. Not use high pressure sales tactics. Do our best to educate our clients or direct them to resources. Submit to PNG arbitration in any unresolved dispute and abide by the arbitrator's decision. CoinStats is the best investment tool for rare coin investors. Exclusively for clients of Mint State Gold (a div of Stuppler & Co). CoinStats is an investment tool that enables numismatic investors and collectors to maximize their return when selecting rare coins. Through in-depth statistical analysis of popular rare coin series, CoinStats identifies the best. We are proud to offer this unique and outstanding investment tool exclusively to our clients. Why is CoinStats so helpful to rare coin investors? Since 1960, our President and Founder, Barry Stuppler, has been helping develop numismatic investment strategies for thousands of highly successful rare coin investors and collectors. About 15 years ago, based on speaking with a number of rare coin investors who were also active in the stock market, Barry realized that there were many similarities between identifying undervalued stocks and undervalued rare coins. He realized that the similarities between stocks and rare coins could be helpful in forming numismatic investment strategies if he could just harvest and properly formulate the needed information. That's when CoinStats was born. Barry started out with the "market capitalization" (market cap) of each coin in the five most popular series of rare U. For stocks: market cap = number of shares outstanding X price per share. For Rare Coins: market cap = population X price. Population is determined by the number of coins graded by NGC, plus the number of coins graded by PCGS; Price is based on the PCGS current list price. The first step in identifying undervalued coins is comparing the market cap of coins based on the formula above. CoinStats then goes on to compare the decrease in population of the next higher grade, to the increase in price of that grade. The largest percentage of decrease in population for the next higher grade, combined with the highest percentage increase in price, identifies the. As collectors and investors are priced out of the market for the next higher grade, their attention turns to these. CoinStats has consistently helped investors outperform even the overall market in investment-quality coins for the past 15 years. CoinStats is provided FREE of charge to all current clients! Stuppler & Company (parent company of Mint State Gold) is pleased to provide all current clients with a free copy of our current issue of CoinStats. Our highly experienced numismatist advisors are available to answer any questions regarding CoinStats and look forward to assisting you with your coin investment portfolio. A PQ (Premium Quality) sticker is awarded to rare coins that pass a strict grading standard created by Barry Stuppler, a well-known and highly respected dealer with over 50 years of experience in the numismatic industry. The founder of the PQ Approved sticker, Mr. Barry Stuppler, is a former President of the American Numismatic Association, the country's largest coin association, where he focused on consumer protection. Barry is also one of the original supporters of the first major grading service, The Professional Coin and Grading Service (PCGS). Barry has a long history of helping collectors and investors to build several of the highest quality and most expensive collections of investment quality rare coins in the world! Based on Barry's experience and expertise he has developed a stringent set of grading standards for PCGS/NGC capsulated coins that when met, those exceptional coins are awarded the esteemed GOLD PQ STICKER. The stringent standards for being awarded a GOLD PQ STICKER are based on the strong desirability of these coins to both beginning and experienced collectors/investors in rare coins. Buyers have shown they want well-struck rare coins that have brilliant surfaces and no planchet problems or die defects. This criteria is not considered by other services that offer stickers, and makes finding a coin with a GOLD PQ STICKER a true beauty to have. Only the highest quality coin, which historically has proven to offer the best appreciation and liquidity compared to similar non-PQ graded coins. CAC (Certified Acceptance Corporation) is a prestigious certification awarded to coins that meet a set of grading standards set by John Albanese with regards to the coins originality. Albanese is the founder of CAC, a leading member of the numismatic community, and an authority on coin grading. For quality-conscious collectors, dealers, and investors, a green CAC sticker on an encapsulated coin has significant meaning and CAC coins often command a premium over their contemporary counterparts. Allow 3-5 days to clear. All orders in the continental U. We do our best to accommodate special requests, however, extra charges may apply. We haven't built our business on clients keeping coins they're unhappy with. If you are unsatisfied with your. Or instructions for returning the item pre-paid. Bullion items are priced according to daily market rates. (a division of Stuppler & Company). 410 Woodland Hills, CA 91367. The item "1924 $20 Saint Gaudens Gold Double Eagle PCGS MS65 PQ Approved Gem graded coin" is in sale since Wednesday, November 28, 2018. This item is in the category "Coins & Paper Money\Coins\ US\Gold (Pre-1933)\$20, Double Eagle". The seller is "verypq" and is located in Woodland Hills, California. This item can be shipped to United States.